This After Action Report is prepared IAW . . . actually, I don’t think there’s an order regarding such a report, so I suppose it’s just In Accord With my particular desire to write up something about HonorCon. Getting to HonorCon was a bit interesting, I have to admit. Texas to Raleigh, NC is a long trip, so driving was out of the question. Fortunately for my geeky fangirl self, Southwest Airlines is now allowed to fly anywhere nonstop (thank you, Wright Amendment, for expiring), so I was able to get a round-trip ticket for relatively cheap (less than $300). The main problem was: stupid maintenance problems delaying my flight for two hours. Fortunately for me, I decided to fly to Raleigh on Thursday night, rather than Friday morning before the Con started. If I’d done that, and had the same plane issues, I’d have missed a lot of good stuff. I recommend arriving early to conventions; you never know what fun stuff you will encounter. The Hilton was very nice, complete with places to eat, so you could just ride to the hotel and stay there the entire time, no problem. The food was a trifle expensive, but good quality, so not too much trouble there. My only complaint is one that will have to go to the Hilton corporate people, because it’s not the fault of their staff or anything. They used those freaking CFL light bulbs in all the rooms, and throughout the hotel itself, which means my poor type-one-diabetic self was getting messed up by the mercury in the air thanks to the bulbs. It made life very interesting (high blood sugars not responding as well to correction insulin; lows more severe than usual), and dangerous on one occasion. This is not a reflection on the staff or the HonorCon folks; just a heads-up for other traveling diabetics (or epileptics). Just be careful, and always check the light bulbs. As for the convention itself, it was pretty small, and therefore probably easier to navigate than, say, DragonCon. This was my first-ever convention, and it’s probably a good thing that I started with it, and not DragonCon. There were always people (like Shore Patrol) around to help you if you were lost, in addition to the handy maps and things, so you knew where to go to find the panels of your choice. At first, I thought having a set of rooms for panels and other things on one side of the first floor and more on the completely opposite side, so that you had to cross the lobby between panels, would be a complete pain in the neck. It made you have to walk fast, but the plus side made up for that. The costumed individuals (and there were a lot of them!) got to walk through the lobby a lot, where ordinary people (I heard one HonorCon attendee refer to them as Muggles 🙂 ) could see them and ask about the fan club. That’s definitely a good thing. I would suggest to the planers that they allow a five minute official break between all panels. Most of the people running one liked to start right on time, and if you had just been to one panel, and had to walk all the way across the hotel to get to the second, you’d miss part of it, and be that rude person who walks in late. I guess asking the presenters to stop at five minutes before the hour might work, but then again, maybe not (because they’re so excited about their topics, and people always have questions). Staggering the start times might be too confusing, though. The panels were all first-rate. I learned so much about writing and publishing from them that the trip more than paid for itself. My favorites were the two on Indie Publishing, with Chris Kennedy and Ian J. Malone, Jacob Holo, and A.G. Riddle. The panels were small enough to allow for lots of questions by the attendees, too. David Weber is a wonderful person, and I know this because I happened to be exiting the main ballroom right behind him, and thanked him for answering my question during the panel. All of a sudden, I found myself with his undivided attention, and got to listen to him talk for almost an hour. I can’t imagine another convention where the author who inspired the fan club cares so much about individual fans, and not just about them as a group. He was completely engaging not just as a panel speaker, but one-on-one as well. The costuming panel was very informative as well. 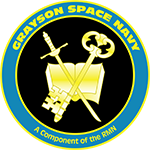 There were panels on Conlangs (constructed languages for your science fiction and fantasy), How To Construct a Navy in Military Science Fiction, and on and on and on. The whole weekend made me wish I was holy enough to bilocate, just so I wouldn’t miss anything. In addition to panels, there were a few other events. My favorite was definitely the Bridge Simulator. I walked in, just wanting to watch over someone’s shoulder, and found myself being told to sit down and play! Imagine the bridge of the Enterprise. Now put yourself on it. It was even cooler than that. 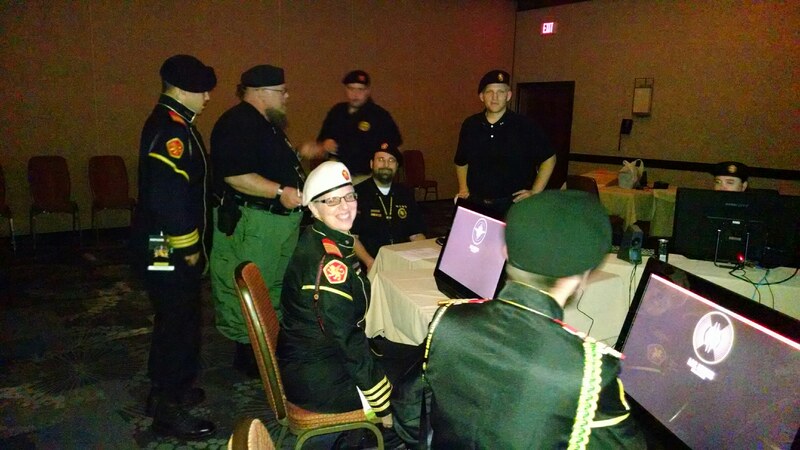 The room was filled with RMN members (most of whom were in full uniform), sitting at various stations (set up with a touch-screen computer), and giving and receiving orders while attacking other ships! That was probably the second-most fun I had all weekend (first being talking to David Weber, of course). The Game Room was a blast, too. They had a lot of various board games set up for people to just wander in and play, and we played Betrayal At House on the Hill. On Halloween. Tons of fun. There were a few tournaments going on, as well. You could play a board game with friends, or try out the Saganami Island Tactical Simulator, or play a session of D&D. Something for everyone. 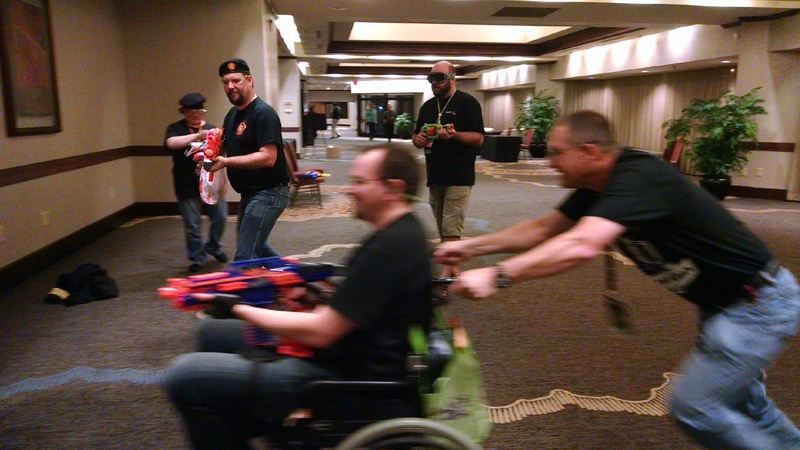 Cry ‘havoc!’ and let slip the Nerf of war! Also a blast: the Boarding Action. Ever wanted to just shoot people with Nerf guns? You got it. I’d never seen a Nerf grenade launcher before. Matthew got to be the tank. Yes, I’m completely serious. There were a few casualties, and I think someone’s treecat managed to rip a few boarders to shreds, but it was fun. The First Fleet dinner was a great way to meet the other members of the HMS Hector and the other ships of First Fleet. The whole group of us went to Bahama Breeze to eat, so it was great food with great company. I was sitting at the same table with the First Space Lord, and didn’t even realize that until well after the fact. 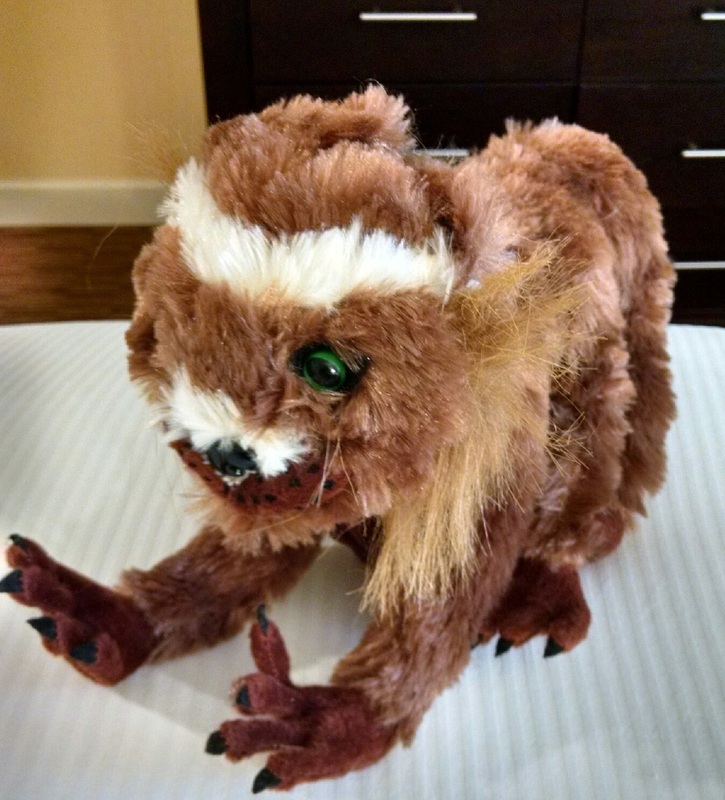 Plus, anything you can buy that is even remotely related to the Honorverse, you could find in the Dealer’s Room. Books, used books, more books, games, t-shirts, and even official BuSup items. Oh, and of course, treecats. And yes, I made up a complete history for Celeste (yes, she is named after one of the stops on a pipe organ; I can be geeky in more than one way), how I managed to get adopted by a treecat while on Grayson, and so forth and so on. Spacer Second Class Lori Janeski, GSN, has a backstory now. Let’s hear it for total geekery! Another great event on Saturday night was the awards ceremony. A few people were elevated to the peerage (ceremony complete with swords! ), and there were a bunch of other awards being given out to people who had done a lot to help. They weren’t just handing them out like candy or anything; you have to actually earn the awards in this club. We got to witness three members being awarded the Parliamentary Medal of Valor. According to one of the members, only five of them have been awarded in the history of the fan club. And, just like the real armed forces, all of us — no matter what rank — rose on cue to salute the recipients. Again, it’s not just for show; people are rewarded for real-life contributions, and that’s something I really admire about this group. Bottom line: great fun all around. I signed up to help with registration. Probably not one of my better ideas, considering that it was my first-ever convention, and I wasn’t quite sure what I was doing, but the people who had been there before were very helpful. It also gave me a chance to see a lot of the fans coming through and registering, and that helped, too. 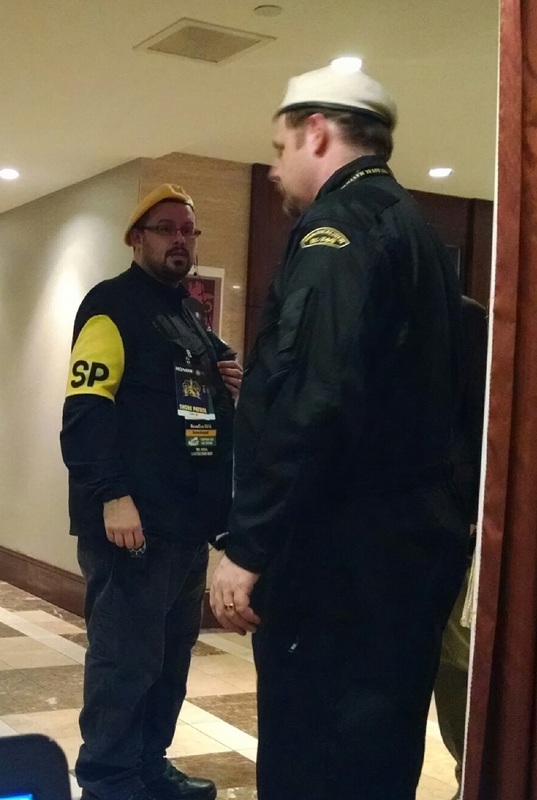 There were volunteers for everything: registration, Shore Patrol, helping with the Con Suite, and on and on and on. It was very impressive that the members of this fan club step up to take care of things. They help each other out, and I was proud to be even a little tiny part of that. Now that I know a little more about the convention in general, I’d probably help out more next time (more hours, probably). I’m kind of a convention newbie, so I don’t have enough experience to compare this convention to others, but in my own never-to-be-humble opinion, HonorCon 2015 was a great success. It was a happy combination of seriousness and fun. Yes, we all have ranks; the costume-wearing folks are completely serious about getting everything just right; we do stand at attention and salute the Prime Minister (aka David Weber); we have members elevated to the peerage, and medals and awards given for outstanding work; and yet, I think we have more fun than the average bear. And that, after all, is the whole point of any fan club. I have a whole list of things I’d like to do for next year. One of which is asking about introducing some English and American contra dancing to the club as “traditional Grayson” dances. That would be a lot of fun, if something like that can be considered accurate, given the way Grayson culture is described in the books. I think so, but I didn’t write it (and I missed the panel on Grayson society, where I could have asked! *sigh*). I think something like that would be worth looking into. I’d love to see how MantiCon is compared to HonorCon, but I’ll definitely try to be back in Raleigh next year. This concludes the After Action Report. Follow the squirrel minion to get to Lori’s website, Little Squirrel Books. This entry was posted in Fiction, Gaming, Personal Posts, Plugs and Promotions, Science Fiction, Video Games and tagged A.G. Riddle, Chris Kennedy, Conventions, David Weber, Hilton, Honor Harrington, HonorCon, Honorverse, Ian J. Malone, Jacob Holo, Raleigh, Starship Horizons, Treecats, TRMN, Writing. Bookmark the permalink.